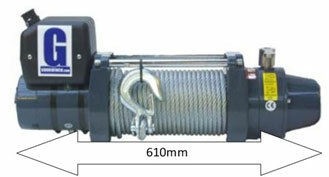 The GP80 series winches are built using the highest grade materials to meet a simple doctrine. Reliability, Strength & Power. Now these world beating winches can offer speeds from 70ft per minute to 450ft per minute and from 3 ton to 14 ton of pulling power. Used by teams around the world they have helped them win the toughest events including, The Malaysian Rainforest Challenge, The Croatia Trophy, Rainforest Portugal, Outback Challenge Australia, Dresden Breslau Poland, Ironman Challenge Australia, Muddy Truckers Trophy UK, Xtrem Andorra, The Ultimate Challenge UK, Russian Off-Road Championship and hundreds more. Gigglepin Winches are built to be reliable no matter what the conditions or the application. Using high quality cast housings; billet machined case hardened EN36 gears, the very best motors and custom built contactors available. Using over 50 different ratio and motor configurations, Gigglepin can build a winch to fit every application and provide the power and strength for every situation. The external mechanical brake on the GP80 series winches is an automatic load sensitive unit that is ideal for all applications offering control on Hill climbs and Descents. Using unique high performance brake shoes and billet brake components, the GP80 series brake is unsurpassed by any other brake. The brake can be submerged in mud and water and can be used with or without lubrication, making it the most versatile unit fitted to ANY winch. Due to the brake being externally mounted, the GP80 series winches are ideal to use with synthetic cables such as Plasma (Gigglepin recommended), Marlow, Dyna-pull, Master pull, Bow rope and other brands as the winch drum never gets hot, unlike other winch models. Despite it's huge 13" drum capable of holding over 200ft of 11mm winch line, the GP80 series winch uses a compact upright design to save space and is considerably shorter than market leading low-line winches. Even with its Twin-motor configuration the GP80 series is only 2 kilo’s heavier than a standard Warn 8274. The winch drum is made in seven individual pieces and is end result of years of research and development. Many companies make winches, but few understand the importance of this seemingly simple component. The GP84 MK4 comes with a 13” (330mm) drum as standard (76mm longer than a standard Warn 8274), but can be specially ordered with shorter or longer drums (extra costs and lead times may apply). The drum has spaced 8mm end plates to help stop deflection and premature gearbox casing damage that can be experienced when using synthetic ropes. The drum also uses a reduced diameter (64mm) spool giving maximum mechanical advantage to the winch for greater power and allowing larger diameter or longer winch ropes to be used if required. Also fitted to the drum is the Gigglepin rope retention device, a simple to use loop on the drum that makes securing synthetic ropes fast and easy. The MK4 drum also has a removable EN36 hardened Dog receiver that is the bedrock of the air operated Free-spool. The drum is induction hardened at the gearbox end and ground to give a perfect running surface for the large bearings that give smooth and silky operation, finished in Gold Zinc for added corrosion resistance. The Free-Spool is air operated and uses EN36 Case hardened dog technology that gives perfect ,fast operation every time. The winch is supplied with an IP67 waterproof toggle switch and a fighter pilot style switch guard. We recommend this is fitted inside the vehicle allowing the driver complete control of the winch at all times. Extra switches are available if required. The Free-Spool system operates using a standard ARB type air compressor as fitted to the majority of challenge/competition vehicles and can use air pressures from 50 to 150psi. Gigglepin could sit back on the hard fought past results. Dominating competition podiums around the world, these winches have won almost every major title and in most cases on multiple occasions. A firm favourite with the best teams worldwide, due to their exceptional performance and reliability. It would be very easy for us to sit back and dwell in our continued success. But continuing development is the big difference between Gigglepin and other winch manufacturers, no other tests their winches as comprehensively or continue to develop new improvements. But not only do we improve our current models but we also offer upgrades for existing models we no longer manufacture. NO OTHER winch manufacturer offers this level of service meaning that no matter what age your Gigglepin winch, you can upgrade to the latest specification. As well as their competition pedigree they are equally at home in other applications and have found their way into many other commercial activities that require 100% reliability, speed and strength at all times. The simple truth is that many winches on the market today are not capable of providing the reliability required in extreme environments. If you have an application and you are unsure of your requirements, call or email us and we will happily advise you.